Kids can never seem to get enough of classic googly wiggle eyes! 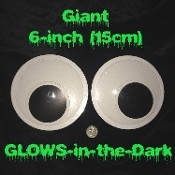 Hysterical massive glow-in-the-dark giant wiggle eyes turn almost anything into a hilarious gag, Halloween or Christmas SNOWMAN decoration. These BIG googly eyes are just like their smaller counterparts, only enormously larger, and they glow in the dark! Jumbo glowing googly eyes can also comfort kids by illuminating light switches, dark corners and other things they may need to find in the night.